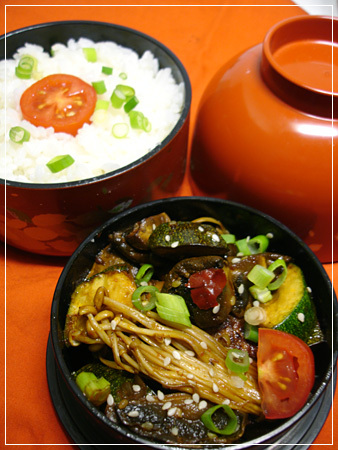 Bibimbap – quick-pickled zucchini with kurkuma, fried carrots, steamed spinach, omelette strips and fried tofu on rice. Chogochujang sauce in the little elephant container, heart candy for dessert. 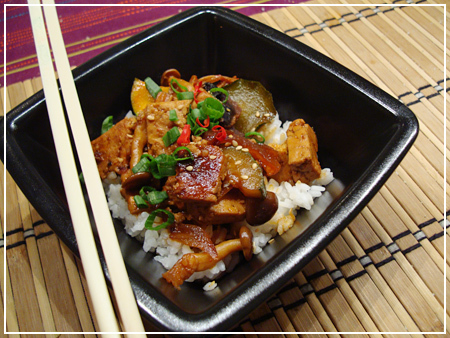 The vegan stew is making an appearance again – this time with sihmeji and enoki mushrooms. Then there’s tomatoes, carrots, a dumpling and a mini muffin, and rice in the top layer. 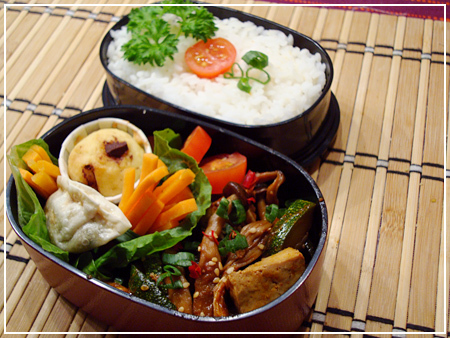 The main dish is vegan, but not the bento. Muffins are kind of hard to make without egg. 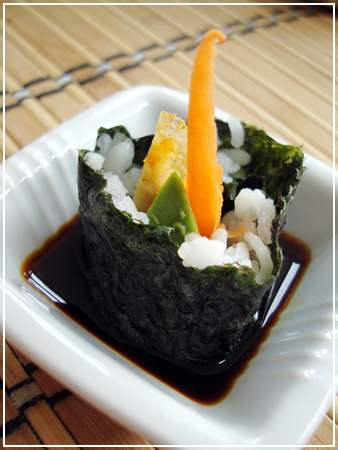 The recipe is not mine, but immaeatchu‘s I Can’t Believe I Ate Vegan Dobu Jorim. Sadly the page the recipe is on does not contain any photos any more, as the blog has moved to WordPress since. But lots of people ask me for the recipe, so I thought I should link it. BF gets the same in a square box. 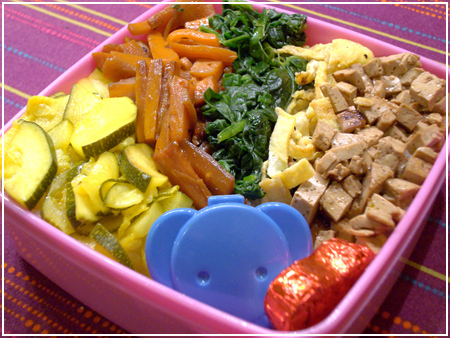 Bibimbap with various veggies, egg and pink-dyed tofu, left over from dinner. Hmm, my picture quality has been better. 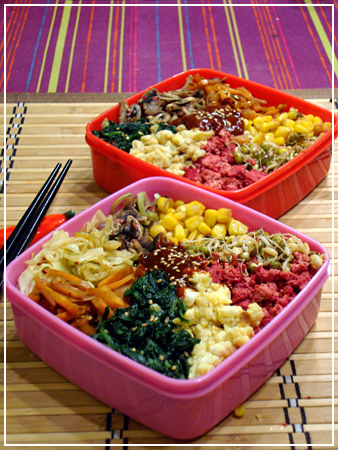 Bento #166 – Furikake frenzy! 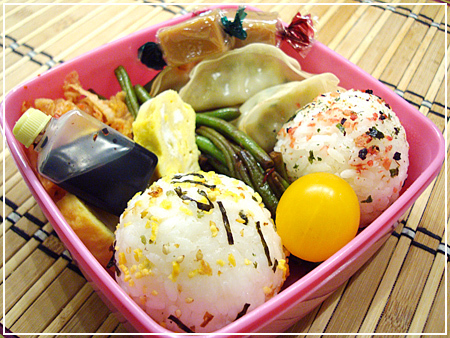 Two plain rice balls, one covered in egg furikake and one in umeboshi furikake. Four dumplings, some microwave egglog, panfried green beans with soy sauce, homemade kimchi, a bottle of dressing for the dumplings and one yellow cherry tomato. Oh, and two pieces of fudge for dessert! BF gets the same, with a red cherry tomato instead of yellow. I got new furikake at the Japan store on Saturday! 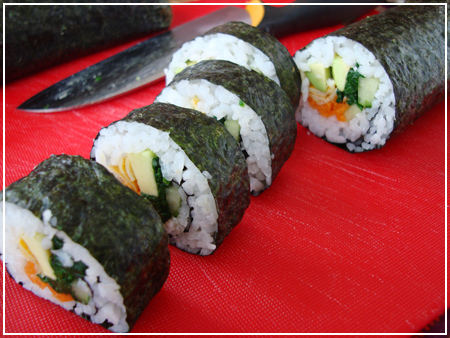 So I decided to make rice balls covered in the stuff. Mmm. Pretty! 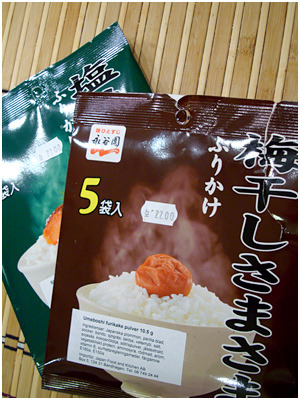 The pink furikake are supposedly umeboshi flavour, but I can’t really taste it. 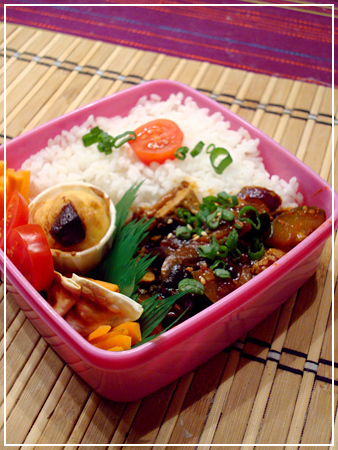 They do contain bonito though, so I can’t mark this bento as vegetarian. Boo. 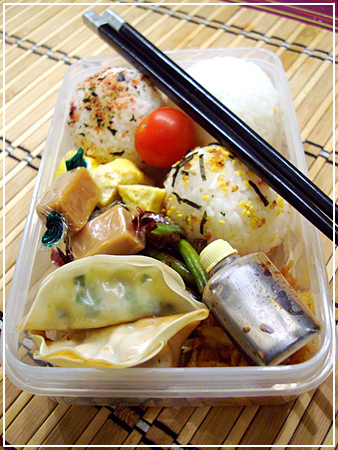 I made this bento from Sunday’s leftovers, for my BF to eat on Monday. Myself I’ve been eating out all week – we’ve been delivering some software and it was buggy, meaning lots of overtime trying to get it to run and no time for making bentos! 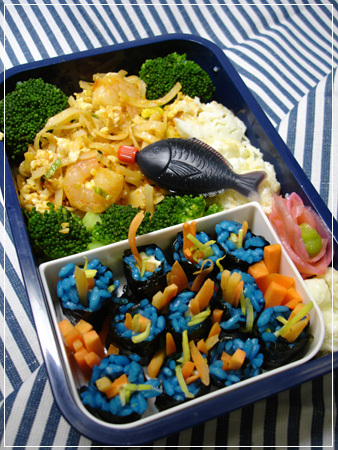 As you can see by me not even posting this bento until now. 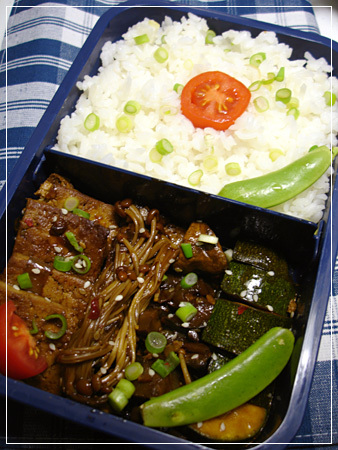 There is also a bentoturf pocket with some wasabi and a fishy of soy sauce in the corner. Here’s to hoping the next week gets better! Dip the tip of the knife into a bowl of water. When you lift it up again, let a drip of water run down the edge of the blade. Do this before every cut, or every other cut once you get practice. Cut with a smooth motion, not applying too much force but rather moving the knife diagonally. Of course it goes without saying that you should use a sharp knife – actually, you should always keep your knives sharp in the kitchen. It makes everything much easier and, contrary to intuition, safer. 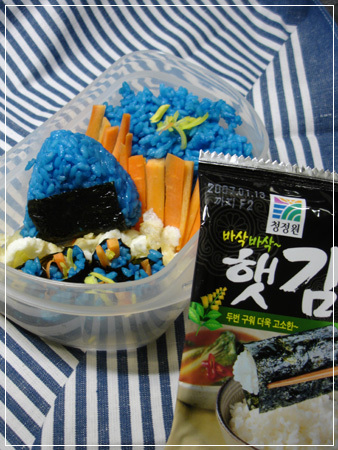 I dyed more eggs yesterday… then the weird idea rode me to make blue sushi rice. Why, I’ll never know. 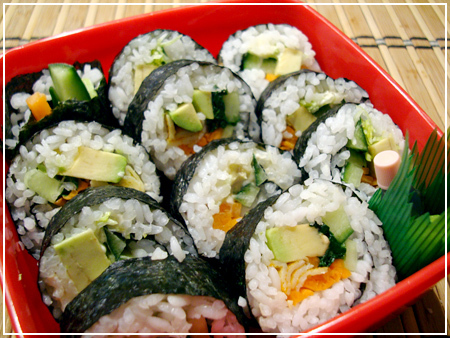 The boyfriend gets sushi, a blue riceball and sashimi, as I got tired of rolling rice at 12 AM.